Almost everyone who visits my garden says, "Wow, what is that?!" They're referring to my Babaco plant! 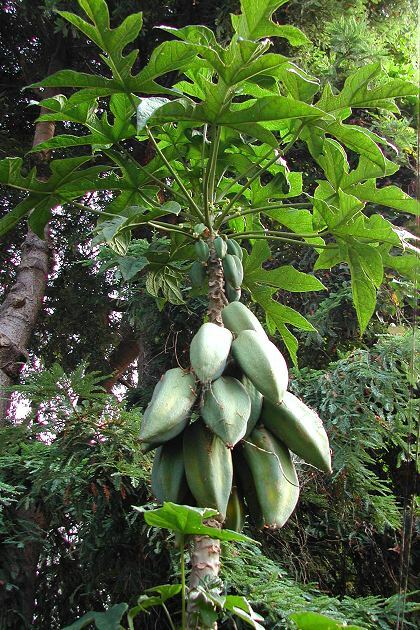 Also called the Mountain Papaya, or Champagne Fruit, the Babaco is an unusual Papaya relative with a unique flavor. The big, football-shaped fruits taste sort of like pineapple or kiwi, and the juicy flesh is effervescent, hence the name "champagne fruit". It's as fun to grow as it is to eat! The exotic, palm-like shape of the plant gives it a great tropical look. And it makes up to 60 pounds of fruit per year! This is a hard-to-find tree that is rarely seen for sale. The Babaco (pronounced buh-BAH-co) is a naturally-occurring hybrid in the genus Vasconcellea, discovered in the mountains of Ecuador. It usually forms a single stem, which grows quickly the first year to 5 or 6 feet, at which point the plant starts fruiting. My tree is 16 feet tall, although you may prune yours to any size that is convenient. The big, hand-shaped leaves grow to be 18 inches across. Babaco fruits ripen one at a time throughout the year. The fruits average 8 to 10 inches long and weigh 1 to 2 pounds each, but can potentially be 4 pounds. They ripen to a bright golden yellow, with a terrific, fruity aroma! The fruit is star-shaped when sliced, so it makes an attractive addition to platters. You can eat the entire fruit, including the thin skin. There are no seeds, since this is a sterile hybrid. The flavor has a hint of its cousin, the papaya, but without the muskiness of papaya. It's relatively low in sugar, so serve it with a light dusting of sugar to really bring out the flavor. It may be added to smoothies, sauces, and salsa - check Google for recipes. It makes a good meat tenderizer due to its high papain content. An interesting thing about the fruit is that it rarely gets moldy when damaged, and any mold doesn't spread to the rest of the fruit. Weird. The tree flowers young and is ridiculously productive! Babaco comes from a mild, sub-tropical climate and does best with moderate temperatures. It has handled temperatures in the 90s (34 degrees C), but it seems to need cooler nights in order to thrive (below 65 degrees F / 18C). It can survive down to about 28 degrees F (-2 C), but protection from frost is strongly recommended. 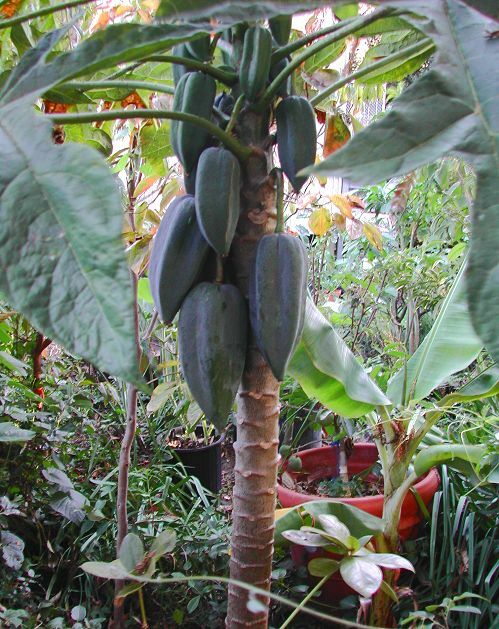 You may be able to increase its cold or heat tolerance by grafting it onto other papayas. Babaco is easily grown in a 10 gallon (40 liter) pot indoors or out. It does not need a lot of sun to thrive. This is one of the few fruit trees that produces well in bright shade or morning sun. Some shade from hot afternoon sun may be needed. Grow it in ordinary well-draining soil, with regular watering and feeding. In the right conditions, it is an easy, low-maintenance plant.